Bit rate and Baud rate, these two terms are often used in data communication. Bit rate is simply the number of bits (i.e., 0’s and 1’s) transmitted in per unit time. While Baud rate is the number of signal units transmitted per unit time that is needed to represent those bits. If we talk about computer efficiency, the bit rate is the more important where we want to know how long it takes to process each piece of information. But when we are more concerned about how that data is moved from one place to another we emphasize on the baud rate. The fewer signals required, the more efficient the system and the less bandwidth needed to transmit more bits. An analogy can illustrate the concept of bauds and bits. In transportation, a baud is comparable to a bus, a bit analogous to a passenger. A bus can carry multiple passengers. If 1000 buses go from one point to another carrying only one passenger (the driver), then 1000 passengers are transported. However, if each bus carries twenty passengers (suppose), then 20000 passengers are transported. In this case, busses determine traffic not the number of passengers consequently broader highways are needed. Likewise, the number of bauds determines the required bandwidth, not the number of bits. Basic Bit rate is the count of bits per second. Baud rate is the count of signal units per second. Meaning It determines the number of bits traveled per second. It determines how many times the state of a signal is changing. Term usually used While the emphasis is on computer efficiency. While data transmission over the channel is more concerned. Bandwidth determination Can not determine the bandwidth. It can determine how much bandwidth is required to send the signal. Bit rate can be defined as the number of bit intervals per second. And bit interval is referred to as the time needed to transfer one single bit. In simpler words, the bit rate is the number of bits sent in one second, usually expressed in bits per second (bps). For example, kilobits per second (Kbps), Megabits per second (Mbps), Gigabits per second (Gbps), etc. Baud rate is expressed in the number of times a signal can change on transmission line per second. Usually, the transmission line uses only two signal states, and make the baud rate equal to the number of bits per second that can be transferred. An example can illustrate it. For example, 1500 baud rate illustrates that the channel state can alter up to 1500 times per second. The meaning of changing state means that channel can change its state from 0 to 1 or from 1 to 0 up to 1500 times per second (in the given case). Bit rate is the number bits (0’s and 1’s) transmitted per second. On the other hand Baud rate is the number of times a signal is traveling comprised of bits. 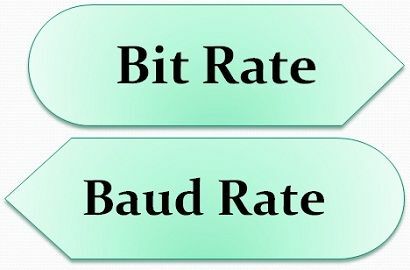 Baud rate can determine the bandwidth of the channel or its required amount to send the signal while through Bit rate it is not possible. Bit rate and Baud rate, both the terms are used in the same way to examine the speed of data. But, the Bit rate is used when we want to know the number of bits transmitted per unit of time whereas Baud rate is used when we want to know the number of signal units transmitted per unit of time.